Before I delve into my destash process, let's look at my totally awesome organizer. Yes, I made it myself. I love it. 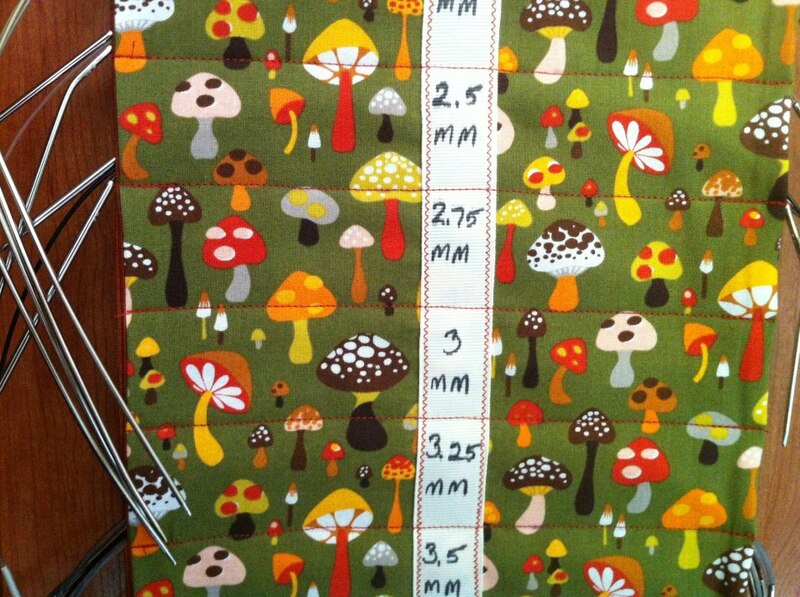 I love the little mushroom print fabric and the twill-tape size label down the center. I love the perfectly-sized pocket at the bottom for a needle gauge. 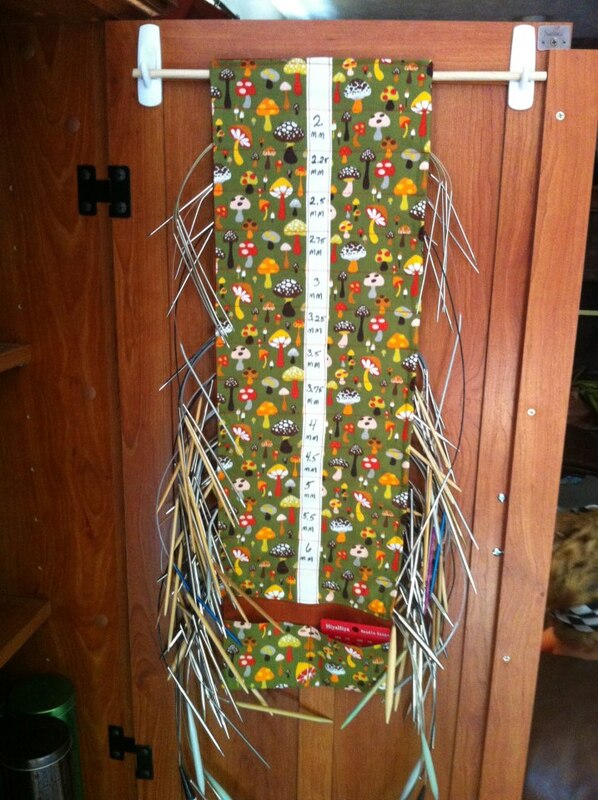 I love the way it hangs in my project cabinet, just waiting for me to cast on something new! Okay, back to the actual needles. Do I really need that many needles. Um....probably not. I've been knitting for more than 14 years, and one just accumulates needles. 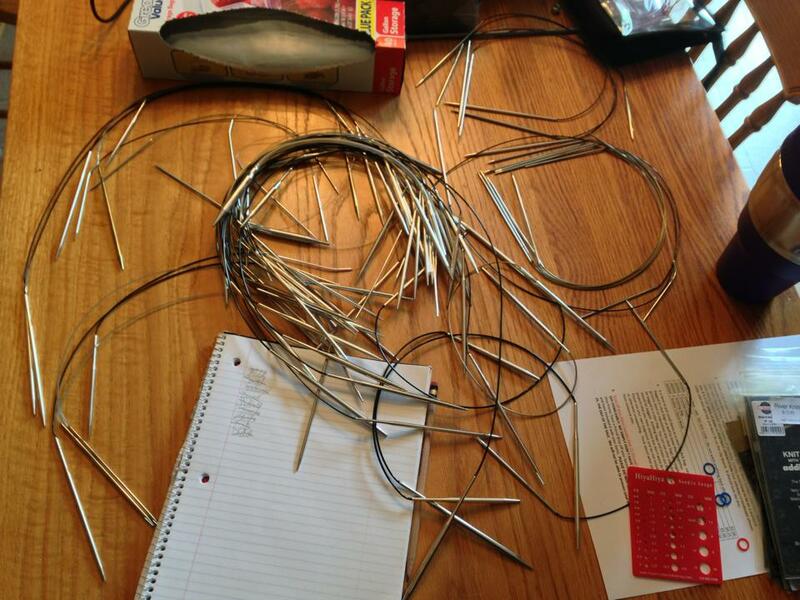 Last weekend, I pulled out all of my metal needles. Addi Turbo, Inox Express, Susan Bates Silvalume and HiyaHiya all came out. That's a lot of needles. Why the metal needles? Don't get me wrong! I love metal needles. Addi Turbos are slick and fast and wonderful. But, a couple of years ago, we learned that I'm extremely allergic to nickel. My allergist told me he'd never seen anyone react as strongly to it as I had. So, what's a girl to do? I ignored him. Completely. I continued knitting with nickel-plated needles for more than a year. After all, my hands weren't reacting to them. And there's no way skin reactions on other parts of my body could possibly be related to the nickel, right? Several months ago, I discovered the wonderful Knitter's Pride Symphonie Dreamz circular needles. And the angels sang. 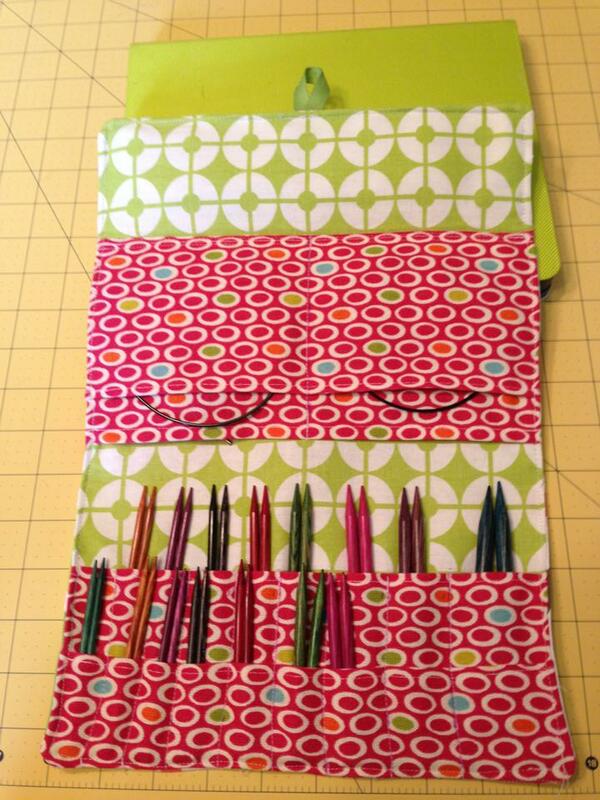 I wanted to use these fabulous things for every project I started, so I bought more needles. After a while of not using metal needles, I realized some of my other skin issues were clearing up. If you are a dermatologist or an allergist, you probably aren't surprised by this at all. But I was shocked. How could something that I'm holding in my hands cause a reaction on my shins? I don't know what kind of magic or witchcraft this is, but I'm fully convinced. Plenty of space for both the full set and the "special" 16" set plus 4 pockets for 4 different cable lengths. See the zipper pocket in the flap? 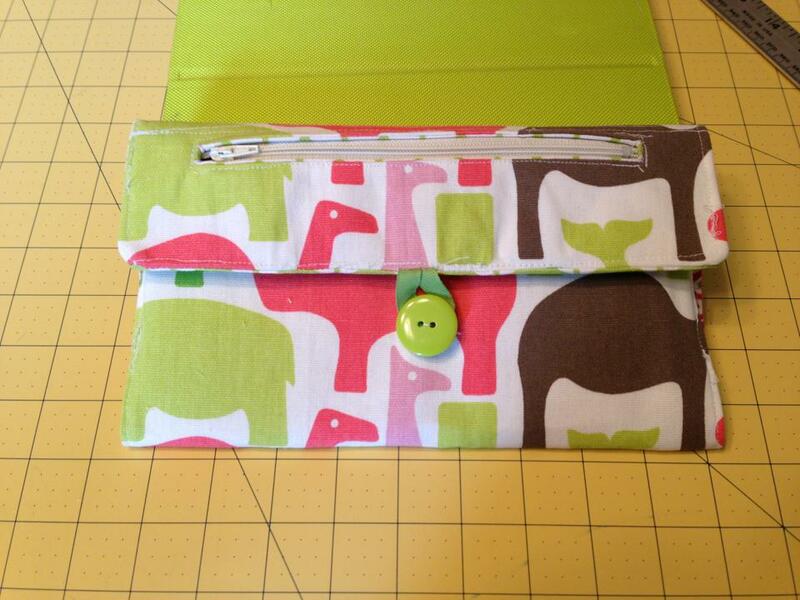 Perfect for all the little bits and pieces--stoppers, tags, and keys. Love it! I also spent some time this weekend organizing my yarn a bit. The last great airing of the stash was in November, and I've certainly made some acquisitions since then. So, I updated my inventory with new things and deleted anything I knew was used and gone. I didn't do a full stash airing, just added things that hadn't yet been incorporated. Mileage update: 105 miles of yarn. Tonight, I'm teaching a class on stash organization and stash busting. I think I'm definitely qualified. I started knitting in 1999 and have identified myself as a Knitter ever since. I've done some design work, which you can see featured here. But, since I got a full-time "real" job in 2009, the designing has taken a back seat. Someday I'll get back to designing more. However, until then, this blog will be dedicated to my knitting, organizing and other fun activities.